As you walk through the streets of Canberra today you might notice a few extra shades of green in the clothes people wear, and perhaps a shamrock or two, or an Irish flag. Towards the end of the day we imagine the green beer will flow in various local watering holes. Yes, it’s St Patrick’s Day in the Nation’s Capital. But for us at Corinna Dental, it’s pretty much business as usual, although you might hear an Irish joke or two being shared around each practice. 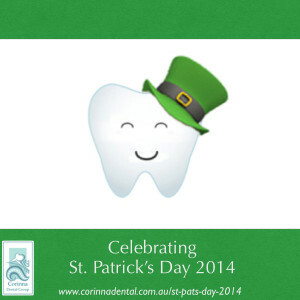 Apart from that, our other nod to all things Irish this month is mention of the articles we found on the website of the Irish Dental Association and that we shared last week. We discovered that there is now evidence that tooth decay is an ancient problem, and that it sometimes takes more than just a brochure or quick lesson for oral health to improve. Can We Learn Enough (And Act) From Brochures?